acknowledge the newest mentees and student leaders in our programs. 2018-2019 ALPHA PHI ALPHA FRATERNITY INC. Applications are to be postmarked and/or electronically date-time stamped no later than Friday, February 15, 2019. No applications will be reviewed after the deadline date. Please direct all questions to: dalscholarship@gmail.com or call (330) 203-1906 until the deadline date. Complete Application Here! Save as you go! Alpha Phi Alpha Fraternity, Inc., Delta Alpha Lambda Chapter is pleased to offer a scholarship to a graduating AFRICAN–AMERICAN MALE SENIOR in high school in the Greater Cleveland (Ohio) area. The monetary amounts are determined by the Scholarship Committee. 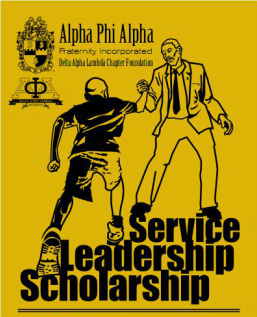 The scholarship application must be submitted electronically on the chapter’s website at www.DAL1947.org. Applications must be received by Friday February 15, 2019 (date/time stamped by 11:59pm of the same date). Following notification of the scholarship award, the recipient(s) selected must provide proof of enrollment at an accredited college or university during the Fall 2019 or Spring 2020 academic term prior to final disbursement funding of the award. In addition there may be other requirements that every recipient and their parents/guardian will be provided. All redemption instructions will be provided. Please direct all questions to dalscholarship@gmail.com or call (330) 203-1906 until the deadline date.